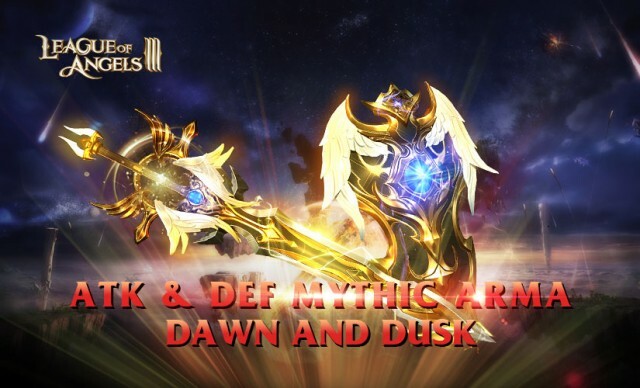 Dawn and Dusk, the brand new Divine Arma set are impeccable, we could spend hours admiring their shining halo and fabulous power, which is sort of what your main character does…until you start collecting their Sigil and Meteor Stone IV and unlock Dawn and Dusk, your character will be able to hold it and release ultimate skills in battle. Forge your destiny in the Angels and keep at it – the challenges and the sense of mystery of Dawn and Dusk only grow stronger as you are on the way to obtain it. --The only Mythic Divine Arma in game so far, the brilliant set Divine Arma Dawn and Dusk is good at both ATK and DEF. --It can reduce rage while taunting enemies with additional damage in battle. --Victoria is the Guardian of Dawn and Dusk. Owning this hero will release the full power of the Divine Arma: attributes +20%. --Besides, its type decides means that all Relics can benefit your main character. Dawn and Dusk own 3 special skills: Sunrise, Call of Dawn and Sartos’ Warcry. Randomly reducing target’s rage to prevent the release of its ultimate skill. Sweeps away the darkness to usher in the sun for the Angels. Attacks an enemy and deals (ATK*140%+400) damage with a 70% chance to reduce the target's rage by 10. Taunting enemies in the front row and converting damage taken to HP at the same time. Paves the way to dawn for the Angels. Attacks all front row enemies and deals (ATK*120%+600) damage. It also has a 30% chance to taunt 3 of the targets for 1 round and gains a blessing that converts 50% of the damage taken to HP (does not exceed 50% of max HP. Effects last 2 rounds. Deals 30% more damage to taunted targets. Increase the chance to taunt by 10% to targets that have less HP than the hero. Dealing damage as well as protecting allies. Taking damage taken by the ally when unlocking Empower Lv. 8. Long live the Angels! Attacks all enemies and deals (ATK*120%+600) damage. Taunted targets take 120% more damage. It also grants a shield that absorbs 20% of the main character's max HP to 3 allies with the lowest HP for 2 rounds. Links up with the ally that has the lowest HP and takes 40% of the damage taken by the ally (except for hen the damage is lethal) for 3 rounds. It also gains an effect that reflects 30% of damage taken (but no more than 60% of the hero's HP). Reflect effect lasts for 2 rounds. Fate doesn’t make a hero – you must grab the most powerful Divine Arma and become one yourself. Test Dawn and Dusk skills in battle and thrill millions of other players!